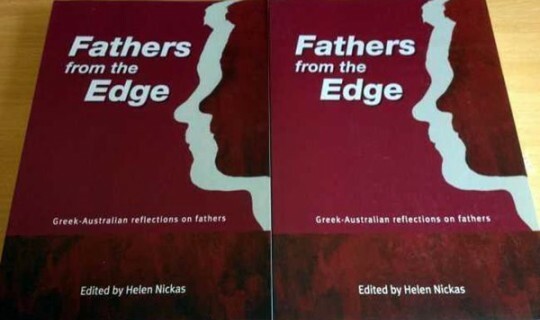 The book Fathers from the Edge - Greek-Australian reflections on fathersÂ edited by Helen Nickas and published by Owl Publishing, will be launched at the Greek Centre, on Tuesday 24 May 2016, at 6.30pm. Fathers from the Edge includes a collection of 24 stories, which examine the complex relationships between Greek-Australian writers (men and women) and their fathers. These 24 stories are a fascinating mix of fathers from the exotic Greek-Egyptian (who came in the forties from Cavafy’s country), to the post-war economic migrant, to the fathers left behind in Greece. In-between, there is a wide range of loving, strict, funny, idiosyncratic, dynamic or fearful fathers, who are portrayed by their sons and daughters in a variety of manner and style. (Victoria) John Charalambous, Konstandina Dounis, Hariklia Heristanidis, Dean Kalimniou, Victoria Kyriakopoulos, Peter Lyssiotis, Melissa Petrakis, Nick Trakakis, Dimitri Gonis, Dmetri Kakmi, Emilios Kyrou, Despina Michael, Olympia Panagiotopoulos, Tom Petsinis, Eleni Frangouli-Nickas. Professor Joy Damousi will launch the book and some of the book’s contributors will read short extracts.